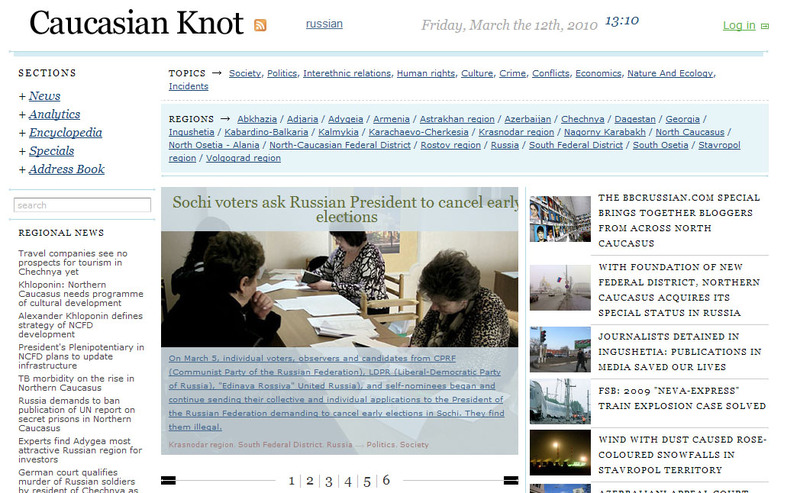 Mr. Shvedov, how did the Caucasian Knot begin? About eight years ago, the international human rights organisation Memorial, based in Moscow, started to develop the idea of an informational resource dedicated to the Caucasus. Since then, things have changed considerably. The Caucasian Knot is no longer a resource dedicated solely to human rights issues and has, in essence, become a professional news source. What are its main aims and goals? Well, being a professional news source and offering independent information is our goal. We do not have other "missions" or "agendas". We are an independent news source publishing hard news, features, analyses, reference data and blogs on the 19 regions that we cover, including the unrecognised territories in the Southern Caucasus and all Russian regions close to the Caucasus range. Of course we do not have any "black list" of forbidden themes or persons as most local and national media have. We publish stories about many events which are sourced from our own network of correspondents in the field and not from other media outlets. You and your colleagues at the Caucasian Knot have probably had to face hardships or problems with the authorities. What kind of problems have you encountered most often? Our correspondents have to face pressures of different kinds on a daily basis. But the Caucasian Knot is not the only organisation which faces these issues. They are encountered by any professional news outlet which is trying to work according to an international standard and code of ethics. Could you mention some examples? I don't like to go around and say how difficult it is to live. I am confident that our readers, reading the kind of information that we publish and knowing that some of our news would not be published by other media outlets, understand perfectly well that we encounter difficulties and pressures of different kinds. We are just normal journalists that try to stick to world standards of journalism. Our journalists are very brave in their attempt to report about real life in the regions, unfortunately, the South Caucasus has become even more unsafe for journalists than the North Caucasus in the last few years. I guess it is no secret that any journalist trying to work professionally and according to these standards in the post-Soviet space, in the Middle East, in China, or in many other countries has to face serious difficulties. What are most readers of the Caucasian Knot like? We do not want to tell people who live in the Caucasus about their lives. We write mostly for people who live outside of the Caucasus, in Russia and in other countries including Western Europe and the United States. Another big group of our readers comes from the Middle East in spite of the fact that we do not publish in Arabic. And, of course, we have readers from the countries of the former Soviet Union. Do you have a lot of readers in the Caucasus itself? According to statistics, the number of our readers in the Caucasus is growing quickly. Clearly, we have fewer readers from South Ossetia than from Azerbaijan or the Rostov region, but for any of these territories we have a significant percentage of overall Internet users who search online for sites dealing with politics. According to data of the Levada Center an independent public opinion research centre based in Moscow people in the region have a level of trust in Caucasian Knot incomparable with other media. Our brand is understood by a significant number of Internet users from the Caucasus as synonymous with reliable information. This is why we are developing our strategy in order to bring information to the people living in the region. Of course, the Internet is not so widespread here as in many other parts of the world, but we see that the number of local readers is increasing. Now it is possible to comment on articles and in a forum, we have published hundreds of pictures and 135 video clips, sent by local readers, and we host blogs, transmitted to Live Journal the most popular blog hosting website in Russia. These initiatives give local intellectual elites and dissenting readers an opportunity to exchange and generate information. You work more and more as an information agency, but you still deal with issues related to human rights and non-governmental organisations working in the region. Do you have contacts with these organisations? What is the situation for what concerns NGOs in the Caucasus? We offer not only updated news but also reference information. On our website, it is possible to consult a database with contact information and basic data about local NGOs, officials, regional laws, biographies and media outlets. We think this part of our work is important because we are convinced that these kinds of independent initiatives are crucial for the future of the region. Unfortunately, we see that social activists are condemned to prison; they are beaten or even killed. On both sides of the Caucasus range things are complicated. Even in countries like Georgia where a lot has been done to improve the situation, we see that, in some cases, activists are persecuted by the authorities. You know that in Armenia and Azerbaijan leaders of social and political organisations sit in prison, not to mention Russian territories in the Northern Caucasus. How should the cooperation between local organizations in the Caucasus and international NGOs develop? What should international organisations and NGOs do to help improve the situation in the Caucasus in an effective way? More efforts and help are needed but unfortunately, in the last few years, we have not seen this happening. We see the opposite: attention and interest are decreasing and there is less and less support, fewer strategies to improve the situation. This attitude must be criticised. Lack of information and lack of interest are very dangerous. We have to recognise that much more could and should be done. After last August's events in South Ossetia and in Georgia, didn't you notice increased attention toward the region? You know...more words than deeds. Everybody talked about the necessity to do something, but this mostly ended up as financing from the international community to Georgia and from Russia to South Ossetia. This is definitely not what is needed because in the Caucasus, there is a corrupt and undemocratic elite and money does not always go where it should. I have recently been to South Ossetia and Western donors keep using the same strategy they had before the August war in spite of the fact that it did not work even then. They offer support through Georgia. At the Caucasian Knot we do not talk about sovereignty or recognition, we just try to work professionally throughout the regions. What is not possible today is to work in South Ossetia through Georgia. Pragmatically speaking, it is evident that you cannot bring help to South Ossetia through Georgia because Georgian officials simple cannot go to South Ossetia and all the resources dedicated to the region simply disappear in Georgia. It is the same as trying to work in Nagorno-Karabakh by passing through Azerbaijan. I have recently been to the Akhalgori region. The situation there is very bad. People do not have work nor any hope of getting a job soon. They do not even have enough food and electricity, which are basic necessities for daily life. It is in such cases that international help is badly needed. The West has closed its eyes to what concerns the Northern Caucasus and pretends not to see what is happening there. The August events have shown that what happened there is not a local conflict - events that took place in a small mountainous region in the Caucasus had consequences for the whole world, including the European Union, the United States, Russia and many other countries. A conflict for a small piece of land had, in practice, much wider consequences than what happened a few months ago at the border between Turkey and Iraq, or even the Israeli military operation in the Gaza strip. These events also caught the world attention, but maybe not as much as the conflict in South Ossetia. In these cases, Nato did not need to change its agenda and there was no relocation of US military forces American military ships reached Georgia's Black Sea coast but were not involved in military actions, which on the contrary has happened with the conflict between Russia and Georgia. You said that Western organisations are not doing enough. What practical steps should they take? What is most important is to leave politics out of international cooperation and support. Today, de facto, just as 10 or 16 years ago, unrecognised states exist and you have to work there as well as in other regions where society suffers from very high levels of unemployment, terrorism, national conflicts, brutal human rights violations, unbelievable corruption and other troubles which are typical of the Caucasus. This does not mean that I propose to recognise South Ossetia, Abkhazia, Nagorno-Karabakh or to stop cooperation in Georgia and Azerbaijan, but there are people who need help there so there is where you need to work. Political interests or the fact that Georgia is closer to the West than Russia, that Azerbaijan has oil and Armenia does not, should not be considered. It has been the absence of international support, not in terms of financing different initiatives, but in terms of practical work to reduce the kind of violence that brought about the August events. The August events are a logical continuation of the policies connected with the concept of "frozen conflicts." "Frozen" means that nothing is happening but, in fact, things were changing very rapidly. This is how we got to a conflict that involved many more than the 40,000 people living in the area. And this approach is not changing, even if there are other situations that might escalate. We need a new strategy of support and development of civil society, both in the South and Northern Caucasus, which includes social and human rights aspects as suggested by a recent op-ed in the Washington Post. Even the European Union, one of the most important donors in the region, does not contribute enough to the projects and does not support independent media in the region. People who work in human rights groups and journalists in the region take huge risks, but they do not find enough support from donors because they cannot produce all of the necessary documents. Mostly they do not pass the criteria to get the documents. Donors are mostly interested in nice, simple projects while long-term programmes are needed for the region. Civil society still has so many tasks in order to reach a stable and democratic state. Only full-fledged cooperation between international, local and national partners will make a real differences in the Caucasus.